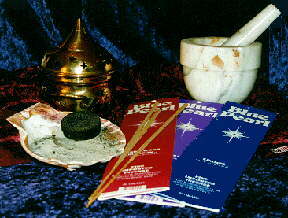 Blue Pearl is the quintessence of incense. The finest fragrances Mother Nature could produce. Each scent imparts its own unique message, from the universal quotes of brotherhood on each back panel to the subtle delight of each classic fragrance.Customers can tell the difference between our incense and the inexpensive synthetic fragrances of other incense lines. One whiff of our fragrance and you would gladly pay the few cents more per stick for the highest quality incense in the world-Blue Pearl. In fact, in the incense world, our reputation is unbeatable. Because of Blue Pearl's amazing and consistent quality, people have written us letters about our superb incense. This letter is from a store. "My customers love Blue Pearl-each one has his or her favorite. 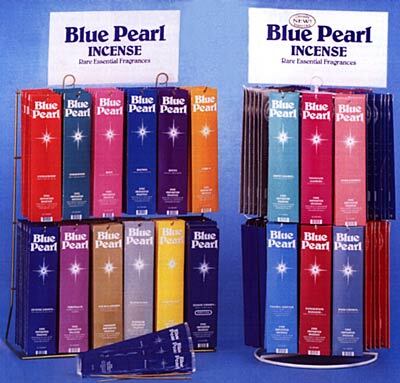 We carry all the big name brands of incense, but Blue Pearl is exciting to sell. "-INNER EYE, New Jersey. "Of all the incense we carry, it's the first one I've ever felt...I can honestly say it surprised me. It's our number one seller. "-GRANARY NATURAL FOODS, Sarasota Florida. A description of each one follows below. All incense $2.99 except for Premium Silver Lotus & Premium Golden Champa 10 gm. each for $3.99 & Jumbo Classic Champa 100 gm. for $8.99 suggested retail prices. Prices may vary in different stores or parts of the country. A perfect blend from natural amber resin. The rarest concentrated essence of our popular classic floral blend. A mild and very special oriental blend of Himalayan cedar. A rich and aromatic variety of Champa with a floral musk note. A light, woody, flowing aroma. A touch of vanilla added to classic sandalwood. of sweet and grassy fragrances, like an afternoon in an open field.